• Pre-sedimentation tank for fine grain matter with an oil separation compartment and decanter for treated oils. 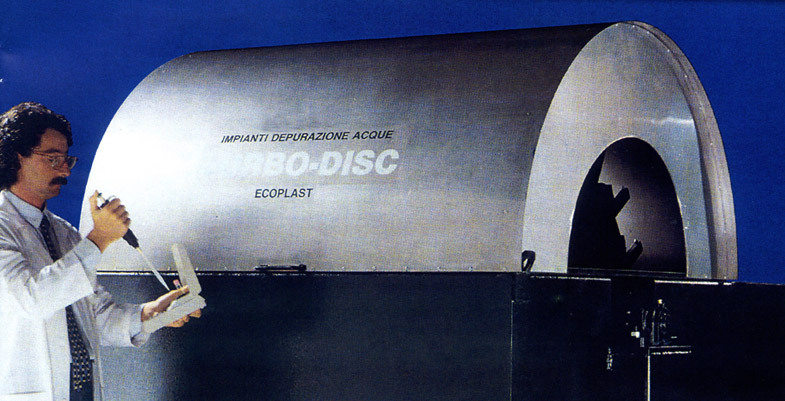 • Final disc-pack sedimentation station. The entire oxidation tank is protected with a stainless steel cover to prevent algae proliferation on the sides of the discs allowing optimal thermal insulation. The other tanks of the installation are closed above with steel panels with handles. Dedicated eyebolts allow for lifting, lowering and positioning. The whole package has been designed for simple installation and operation. Feeding is guaranteed via a submersible pump in the imhoff tank where sewage is conveyed. Pre-sedimentation tank an oil separation is divided into 3 smaller sectors. In the first sector heavy matter will lay low, like sand, while in the second sector the disc-pack will sunder oil and grease from sewage stream. The separated oils then go through an adjustable duct to a collection tank via gravity. Each section is easily reachable for cleaning and has a manual discharge valve (timer is optional). The de-oiled sewage enters the oxidation tank via a siphon where the TURBO-DISC grants biological oxidation of organic matter. The sludge here produced is taken away by the exit stream and separated in the disc-pack sedimentation tank. The depurated water is evacuated via an adjustable stainless steel duct.